Mamelodi Sundowns crashed out of the Caf Champions League as they were held to a 0-0 draw by AC Horoya in a Group C match at the Lucas Moripe Stadium on Wednesday evening. The result saw Sundowns finish their group fixtures with six points from the same number of outings. It put them well short of leaders Wydad Casablanca (12 points from six games) and second-placed Horoya (nine points from six games), who qualify for the quarterfinal knockout stage of the competition. For Sundowns, the biggest concern is that they have gone 290 minutes, since their last goal scored, which was by Wayne Arendse in the 2-0 win in the MTN 8 quarterfinals over Golden Arrows. Not that Sundowns didn’t have their chances to avoid this embarrassing statistic. 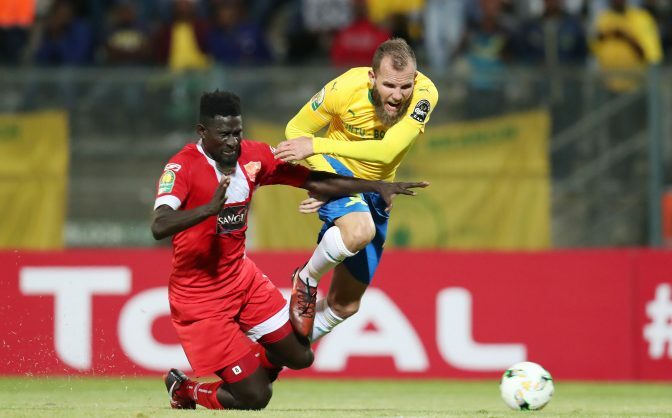 This time it is the foreign legion who have to bare the criticism, with striker Jeremy Brockie having missed out in shooting straight at Horoya goalkeeper Khaduma N’Diaye in the 18th minute. Sundowns’ inspirational Uruguayan striker Gaston Sirino may have one of the highest work-rates in the team, but he too fell foul of the goal-scoring bogey, with his best chance being spooned over the Horoya crossbar in the 45th minute after he received a cross from the left from fullback Tebogo Langerman. Luck did not seem to be going the way of the men from Chloorkop either, with Langerman’s effort being cleared to safety by the Horoya crossbar in the 63rd minute. At the other end of the park, Sundowns keeper Denis Onyango did well to keep a clean sheet in tipping a long range pile driver from Aboubacar Camara wide of danger. Not even the introduction of Anthony Laffor (for Brockie) and Lebohang Maboe (for Tiyani Mabunda) could unlock the Horoya defence. Sundowns will have much homework to do before facing Cape Town City at the same venue on Sunday. Sundowns trail 1-0 after the first leg cup action in Cape Town last weekend.